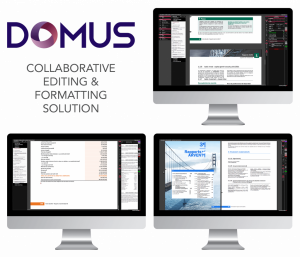 With Domus, implement a template with your graphic standards which will apply to all your documents and by all the users. The work of your experts and analysts is highlighted by the application of professional rules and our experience in report conception. Directly modify your content and insure a continuity from one publication to another. Modifiez directement vos contenus, et assurez la continuité d'une publication à l'autre. This way, you will capitalize on an optimized process. One single, up-to-date version, accessible 24/7 online with the possibility of working simultaneously in order to act more efficiently, without having to write or read an email. Your source data are traceable, reliable and respect European standards. 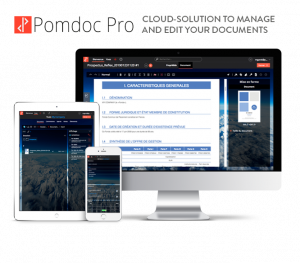 With Pomdoc Pro, you can generate many documents instantly, by your graphic standards and immediately editable online in a secure environment. All the people who participate in your production can share and see one or several libraries inside your platform. Once available, they will be stored and you will still be able to easily edit and duplicate them. Import easily your data and generate flows of automatically updated documents. The graphs are updated too and the texts are instantly available in the usual formats for translation. Secure your work and garanty that the information you share is reliable.